It is well known that simulation helps to improve the process of satellite design and verification. The Virtual Spacecraft Reference Facility is a spacecraft test bench used to demonstrate the added value of simulation in the design, testing and verification of a satellite avionics sub-system. Typically different simulators are developed throughout the satellite development to support validation and verification activities. By adopting the Virtual Spacecraft Reference Facility tools and methods, the evolution of the same simulator and infrastructure to support the associated verification and validation activities at system level in the various project phases shall be simplified. The VSRF infrastructure was developed in the TEC-SW laboratory as part of R&D activities. The VSRF objectives are to use a system and mission simulation early during the design phases, in order to validate performance and robustness of the design and support trade-off analysis at system level. In such a way industrial proposals and project reviews can be supported more efficiently and the engineering design margins can be assessed realistically and optimised. The VSRF simulation evolves to support verification tasks, e.g. software verification and AIT activities involving hardware-in-the-loop configurations to test EM or FM components. The VSRF objective is to provide a generic architecture to build a virtual representation of the spacecraft in support of space system design and verification activities. By virtual representation it is understood a functional simulation at system level that can evolve from phase B (and even phase A) to phase E supporting the system engineering activities (e.g. system design definition and validation, system end-to-end qualification tests, system AIT and operations preparation). The VSRF architecture shall also allow a more representative “validation in context” of the components of the various simulated or real hardware models. 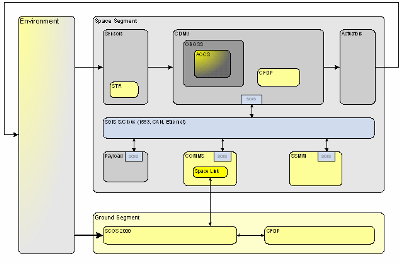 By means of different instantiations of the very same simulator infrastructure, the VSRF avionics simulations support the design life cycle from the implementation of the functional AOCS simulator to the implementation of a system simulation in a real-time environment up to the execution of the AOCS control law in an on-board representative CDMU executed within an SVF. In order for the VSRF to provide maximum benefit, it shall be applied throughout the simulator development process, starting at the latest at the beginning of phase A. In fact during the early project phases the functional simulators are developed in the context of a specific domain or subsystem (e.g. AOCS, Power, Thermal and Structures). Specifically in the VSRF, a functional sub-system simulation of the AOCS is performed and the AOCS engineer supports the avionics development by providing the models of sensors, actuators and the closed loop control law and supports the integration and testing in the system simulator. The VSRF tools and methods (e.g. 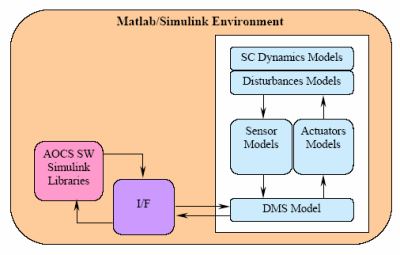 MOSAIC 7) allow the simulation engineer to export and test the avionics models from MATLAB/Simulink into the real-time simulation environment (i.e. EuroSim) where the AOCS closed loop simulation is run in a more representative system context. The added value of the VSRF is to allow the execution of the tested and validated sub-system (e.g. the AOCS control loop) “in context”, together with simulated equipments (e.g. thermal, power, communications) in a dedicated simulation environment.